I have a pretty card to share with you today, which was made for three different challenges, all from Splitcoaststampers. 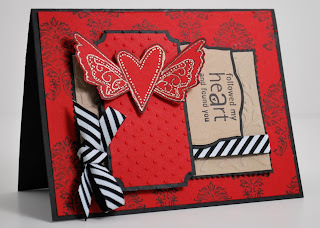 One was their weekly sketch challenge, second was the Ways to use it by Julia, which this week was to use RED, so I did, and lastly it was Corry's challenge from Unity, which was to make a card and not use any patterned papers. Well, that was perfect, as there is this really pretty stamp from this month's kit that was calling me to create a background anyway, so I finally got a chance to create with this stamp. Feel free to click on the card to enlarge. Hope you like my card and wishing you a fabulous weekend!